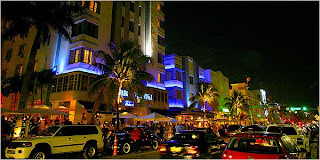 Affordable comfort food and international newsstand on Ocean Drive, the hippest and most beautiful stretch of Miami Beach. If you want a laid-back, yet trendy spot on South Beach, the News Café is the place. 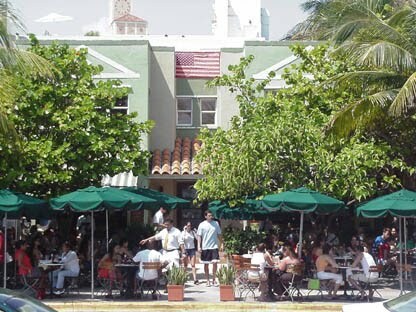 Opened in 1988, the owner (who has since opened several other successful restaurants around Miami) started with a few tables, a couple of bookshelves and a newspaper kiosk. Today, the restaurant boasts a sprawling sidewalk café and an interesting newsstand/gift shop. Check out the shop’s wide selection of beautiful, Miami-themed coffee-table books. The restaurant is located at 800 Ocean Drive, at the corner of Ocean and 8th Street. On-street parking is nearly nonexistent, but there are several nearby parking garages that are reasonably priced – but may fill up on weekends or during special events. This is one reason why the restaurant does not earn a full five stars; on some busy weekends, it’s nearby impossible to park – and then the wait for a table at the News Café can be long. While the News Café is a perfect place for a burger and fries, many enjoy the round-the-clock breakfast. Eggs Florentine, buttermilk pancakes and smoked salmon on a bagel are welcome noshes after dancing all night at the clubs. Or, if you’re not in the breakfast mode, don’t miss out on the Middle Eastern Combo, a platter with hummous, tabouli salad and grape leaves. 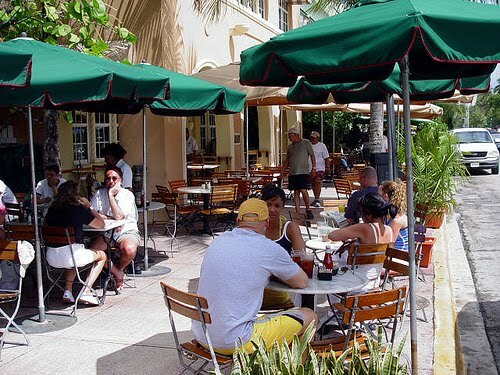 You can’t go wrong with whatever you order on the extensive menu – and you will love watching the international (and often beautiful) crowds pass by on their way to and from the beach, which is right across the street! Click here to SAVE on Dining! 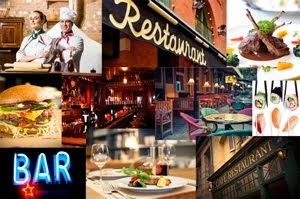 Click here Save Up to 60% on Restaurant Gift Certificates: $25 gift certificates for only $10!